Cobalt Drill Bits are made of cobalt and steel alloy in different proportions, and they are meant to drill into tough surfaces such as cast iron and stainless steel materials. They can, however, be used to cut into soft materials too. These bits are quite expensive compared to other types. However, they are a bit brittle, and therefore should be used with care. Titanium bits are coated with a tough titanium layer for durability and fitted with a speed tip of 135 degree that minimizes walking. Titanium Drill Bits are suitable for cutting light-gauge metals. The drill improves and speeds up chip ejection due to its parabolic flute design while drilling. Sometimes in extreme heat conditions, a drilling fluid/ lubricant is used to curb premature drill bit breakage or failure, and to make sure that the part being cut is not cracked or damaged. Some metals like bronze and other non-ferrous metals are discolored as a result of drilling heat, making it essential for regular lubrication. Cobalt drill bits are known as the best choice drill bit for hardened tough metals and in situations where high temperatures are generated from cutting into stainless steel. If a big hole is needed, the part to be drilled should be protected with a jig for stepped cutting until the desired diameter is met. The downside of this type of drill bit is that the cobalt and steel alloy coating makes it a bit brittle. 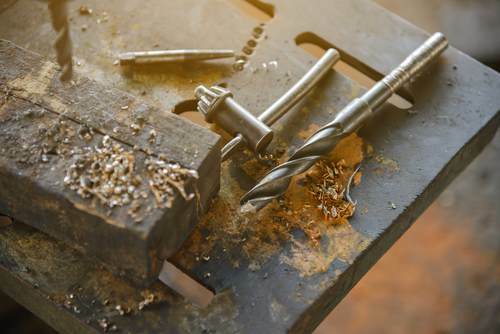 Titanium drill bits are capable of coping with heat since their titanium coatings enhance the dissipation of heat buildup more effectively compared to most drill bits, but they are quite expensive and don’t have the durability of cobalt bits. Therefore, it is no surprise that most people prefer using cobalt bits as they offer better value for money. There are some specialty bits for metal working, like the rolling cutter drill bit. This bit has an improved thrust face bearing structure that uses at least two different bearing metals for increased precision in high heating situations where single cobalt-coated drill bits for metal would fail. Thus it remains important to evaluate the job at hand before deciding on which bit to use. Otherwise, you might end up spending money on something you don’t need or damaging the metal by using the wrong bit. (1) The drill has a tight shank grip for better chuck hold. (2) The titanium coat hardens the bit’s surface, improves the drilling time in tough, as well as regular applications and also acts as a lubricant replacement, producing less heat, for a longer bit life. (3) The speed of the drill removes the dust away from the tip more rapidly, therefore reducing friction for less wear & tear. (4) The 135-degree split point minimizes drill walking. Cobalt drill bits can be depended on for durability. These are well-crafted drills suitable for all applications – commercial, engineering, construction or home use. This type of bit is specifically designed to drill and cut into hard steel. The cobalt drill bits are highly resistant to heat and are capable of coping with temperatures of up to 1100 degrees Fahrenheit. The drill bit toughness rating is unique, carrying a general hardness of 66-68 HRC. The drill bit has a wide helix web design, providing great performance and efficiency. All cobalt bits that use a split point are bigger than 1/8-inch, starting contact all by itself with absolutely no center punch required, and no skating or walking of the drill bit. Despite how abrasive or hard the material is, cobalt drill bits will handle and conquer the job easily. Even hardened stainless steel, titanium, and cast iron pose no issue. This bit set will punch easily through the hard materials with minimal issues and will not dull easily; it is a great set for any workshop. Cobalt steel alloy bits are quite strong. It is used on wood, bricks, concrete and other construction materials. It retains its sharpness even after a considerable period. These bits are often used in precision industrial wood applications with minimal breakages of the material being cut, and it tends to be highly expensive. However, there are numerous online stores which sell the bits at affordable price rates. Some of the reputed stores offer customized products to the buyers based on specific requirements. Titanium bits are also common tools used for making holes in wood. There are advanced versions of these bits which can be used to bore holes in steel. Even though these bits are among the expensive varieties of tools made available these days, they tend to get overheated and seldomly retain their sharpness with prolonged use. The spiral around the drill bit removes the chips from the hole while drilling. The closer the curves are to one another, the faster material chips will be ejected outwards. Point angle at the tip is the angle formed at the drilling edge of the drill bit. For harder materials, a larger point angle is required. For soft materials, a smaller point angle is preferred. The lips of the bit are the spiral cutting edges. The lip angle determines the aggressiveness of the cutting. The length of the drill bit decides the length of the hole that can be drilled. The longer length bits will drill longer holes. Drill bits come in a set of standard lengths, so be sure to get the one suitable for the hole you have to drill. To sum it up, drill bits need to be rigid so as to be able to take on any hard surface during drilling. 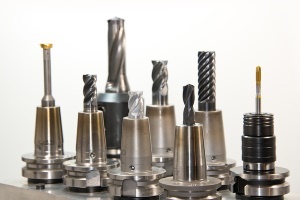 Parameters that are considered while selecting the materials for manufacturing drill bits are the material’s hardness, strength, longevity, sharpness retention and resistance. This is why different drill bits will be good for drilling different materials, and can be very expensive, relative to all other parts of a drill machine. Cobalt and titanium bits are both great as drilling and cutting tools. 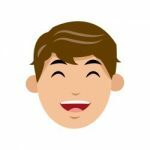 Therefore, choosing which one to use depends on user preference and the type of job that needs to be done.